The VisionTek Performance 900378 Desktop Memory Module delivers superb performance for your daily computing needs. This 2GB DDR3 memory module enhances data throughput, which makes applications run faster. Being unbuffered ensures unrestricted functioning each and every time. The VisionTek Performance 900378 Desktop Memory Modules is manufactured with the industry leading patented testing and verification, and it is built to last even under the most demanding environments. 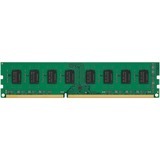 Upgrade your system with the VisionTek Performance 900378 Desktop Memory Module now.